I love pesto! Love the fact that this is dairy free! I made a pesto(ish) sauce the other day using my basic oster blender. I boiled some water and threw spinach and garlic in for 2-3 minutes and then I blended it; with some basil (used the hot water to cook up some pasta) so easy and delicious. I didn't add any nuts and used about the same amount of olive oil as you with just a bit of the hot water. 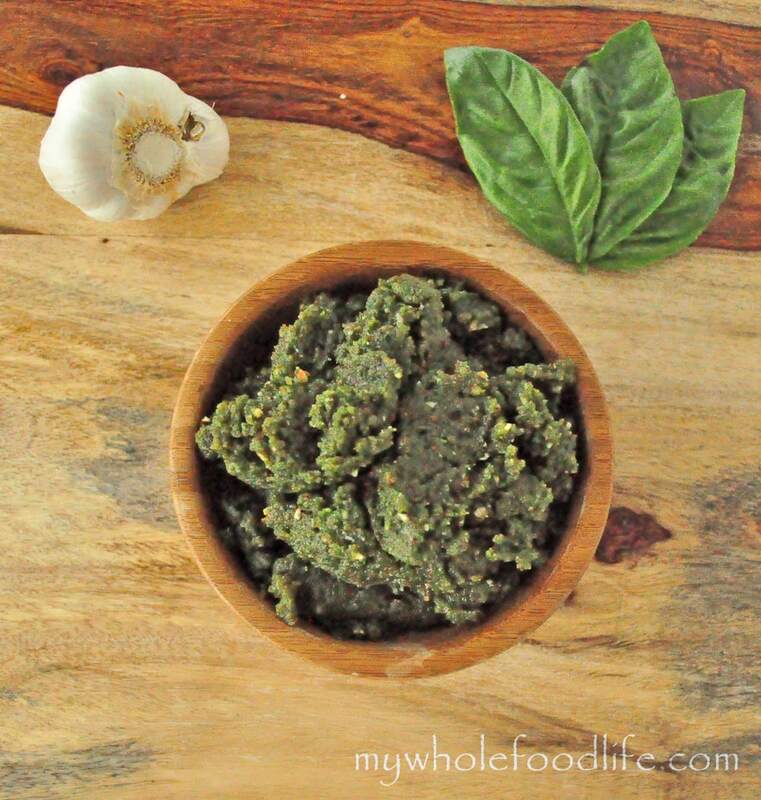 I have been looking for a version of pesto to try with my parents (who eat fat-free vegan). Couldn't imagine a pesto without oil or nuts or dairy. Thank you!!! Can't wait to try this! That is a tough one. Maybe you can sub the nuts for oats? I think they may be fat free. Or even quinoa? I am not sure. Just guessing. I have heard that nutritional yeast has excitotoxins and that it can have similar effects on the body as MSG. Do you know anything about this? I guess there is an ongoing debate, here is one source, http://www.daystarbotanicals.com/nutritionalyeast.html I used to eat tons of it because I love it, then I came down with a rash and I think it was the yeast causing it. I still use it in small amounts now and haven't gotten a rash, but I'm afraid to use it often or a lot - and am still waiting for a good answer on it from someone who knows about these things (I am definitely NOT an expert!). Neither am I and I will keep looking for an answer. We don't use it too often and no one in my family has gotten a reaction. I think my husband uses it the most. No expert here either but the rash thing caught my eye. My mom has had a horrible rash for a while and got no where with doctors. She finally went to a dermatologist. She is histamine intolerant. She quit eating foods that are high in hists. or instigate it. I just checked and nut. yeast serves as a catylyst. Your rash could be a result of that since you ate so much. I found this interesting. Do you recommend squeezing any lemon juice in your recipe to stay fresh or for the color to stay? I never had a problem with the color staying, but you could do that. I usually do lime juice on avocado dishes, but this pesto has never had that issue. If I dont have spinach on hand, could kale work as a substitute? i love all of your recipes and make many of them! Yes, kale would work great! This is a great, simple recipe. I'm not a vegan, so I used parmesan instead of the nutritional yeast. I also used walnuts instead of almonds. I made it in a blender, so I had to add a bit of water to make it work but it turned out great. Hi Melissa, do you use cooked or raw spinach for this? Thanks again! I am growing basil in pots on my deck, and have all these ingredients on hand. I am going to make this as soon as I have a few minutes. I have pine nuts available, so will use those! I will freeze in ice cube trays, then bag it for easy access. I made this today and it is sooo good! Thank you, Melissa for another easy and healthy recipe. You are so welcome! So glad you liked it!